Actually, that may or may not be entirely true, since I have no idea if there’s another game which increases the challenge as time goes by, the way Risk of Rain does. Kinda wish more did, though, because it adds a sense of urgency to a genre known for slow-paced gameplay. 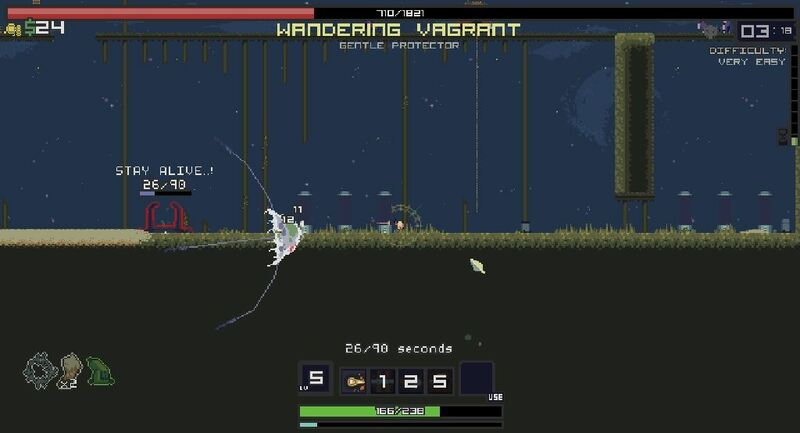 But other than the ticking clock, all the usual suspects are certainly present and accounted for: permadeath, randomly generated levels, a currency system, several (two in the demo) different classes, each with their own unique abilities and so on – a roguelike through and through. One of the things that made Risk of Rain so enjoyable for me, was the low learning curve. I had no trouble learning as I went along and never felt that I struggled to figure out what was going on. Definitely not how most games in the genre work, as they tend to throw a ton of information at the player from the very beginning. Most roguelikes have a plethora of character statistics (strength, dexterity, intelligence etc.) to keep track of, along with all kinds of different weapons/armor pieces and other things, on top of actually trying to stay alive (turn-based or not). Risk of Rain does away with all that, in an effort to keep everything simple and accessible (spoiler: it succeeds). Do not mistake this for fun having been thrown out the window however, because nothing could be further from the truth. There are only two characters available in the demo, the less agile Commando and the close-combat Miner with abilities that focus more on time-to-get-the-beep-away, whereas the upcoming full version will feature a whoopin’ ten. My personal choice would be the Commando, hands down, as I found the Miner’s melee-centric combat a tad bit boring. Risk of Rain aims to revitalize the genre with stylized graphics and an intuitive gameplay scheme that teaches itself, rather then having to be taught. After picking a character and difficulty level, you’re sent straight into the game – no silly background story here, just good ol’ action and boy is there plenty of it! With four character specific abilities and a consumable item, all with their own cooldown timer, combat may remind some of that in certain MMORPGs. Throughout each level, you’ll be facing all kinds of different enemies, most of which act as mere fodder that line up for a beating. Once you get to the second level however, the challenge increases noticeably; that is, provided you actually survive the first one! “Gentle Protector”? More like “Incredibly Hostile Lifeform”! Remember how in genre classics like Rogue, Moria and Nethack, you had to locate the stairs leading down to the next level? 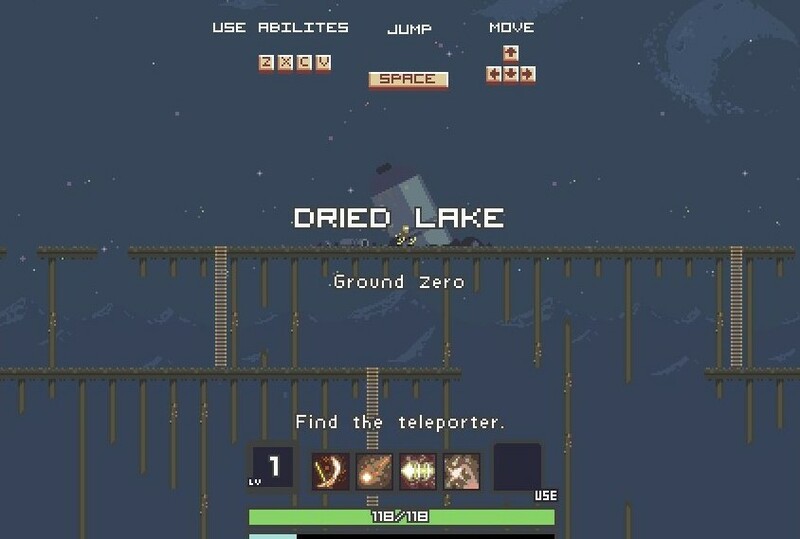 Your objective in Risk of Rain is somewhat similar: “Find the teleporter.” There’s more to it than a simple romp through each level, blasting, smashing, slicing and slashing enemies left and right as you search for the exit, however. 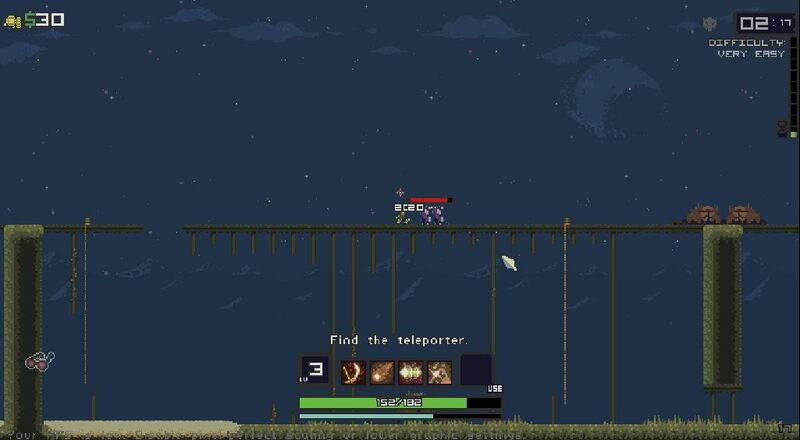 Reaching the teleporter is only half the challenge – you’ll also have to survive for 90 seconds and clear the area of enemies before you can use it… What? I never said it was an easy game, but it sure is fun! While you’re not busy fighting, there are also chests to loot and this is is where the currency comes into play, as you’ll have to pay to access their contents. How does being able to restore health each time you damage an enemy or cause nearby enemies to take damage sound? Definitely worth paying for, even if you only get to keep them until your untimely demise; but you also lose all your money upon dying, so… might as well spend it while you can. Since I’m sure you’re more than likely quite eager to actually get to play Risk of Rain at this point, here’s the download link and one to the developer’s website, just in case. Have fun!